I am not a technical person but I try to keep up with the blockchain scene. The intent of this post (and my blog in general) is to keep things simple so that they layman can understand and hopefully through constructive criticism to develop new solutions for the future. So far we have seen two ways to secure a blockchain network. Proof of Stake and Proof of Work. Proof of Work is used when we mine a coin, aka using the actual computer power to solve a problem. Bitcoin uses proof of work. Proof of stake is used when the tokens are pre-mined and they are rather staked within the network, covering for the fees in transactions. Dash is such a coin. Ethereum and EOS will also work around PoS in the future. Both techniques are sufficient yet problematic. Proof of work demands extraordinary amounts of power and can be gamed or monopolised. Proof of stake can also be gamed by those who hold the majority of tokens leading to not so much decentralised networks. It also hasn't been demonstrated to work securely although great advances are being made. The common denominator of both is that they can be gamed extensively by the human factor. Proof of Trust secures networks in a completely different way. In order to explain how this could work, we should take the human brain as an example. Intelligence is an emergent property of our neural cells firing through our synapses. The more firing that occurs, the more one process is imprinted and therefore learned. This is how we become good at stuff. The more we practise playing the violin the better we become due to the training of specific neural networks needed for a specific task. What our brains do when they learn something is Proof of Trust (PoT). The networks that are used for specific processes become better and more efficient. Those that are not needed fade away and become either inactive or completely removed. 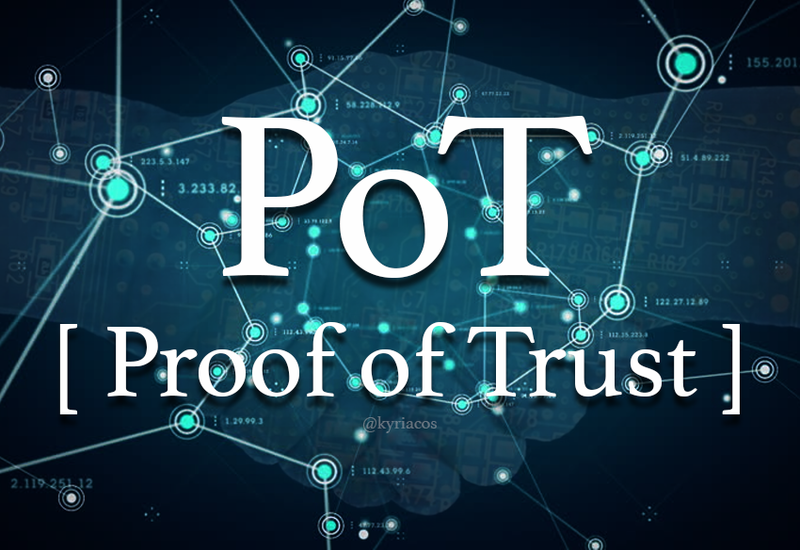 In the future, Network chains will use Proof of Trust in order to interact with adjacent Dapps. Depending on what action is needed (and where is needed) the network will reinforce specific nodes in order to accommodate. If for example a network chain demands to interact with a charity Dapp due to a recent catastrophe, the nodes that will assist the effort will become primaries. Later on they will be used for similar situations. As the network expands, different Dapps will interact with one another and create different levels of primaries. Ultimately, the network will be able to make intelligent decisions by itself without any need for interaction from the stakeholders other than the supply of Dapps. Primaries will be decided based on the network effect of each Dapp. The success of each Dapp will depend on consensus and implementation. It is great to see this technology finally coming out. I am waiting for recombinant block-chains. Chains that will split, and can come back together. Imagine bitcoin cash and BTC getting back together. I wouldn't call proof of trust an AI, unless what you mean by AI is expert system. It will not try to take over the world, it will never have any intelligence to do so. Thank You for introducing new concept. Can You recommend any sources for further reading?